I have heard that the ELSA operating limits now preclude IFR operation by incorporating the POH into the OL. Mel, is that true? Mine issued in 2012 allow IFR if so equipped. You can modify the POH of an E-LSA as you wish. That's part of being an experimental aircraft - of any type. If the feds quoted a revision of the POH I think you’d be stuck. That's simply not how it works and I don't believe they could do that if they wanted to do so. I can’t say I know for sure, so I hope you’re right. I’m just happy my OLs are written the way they are. 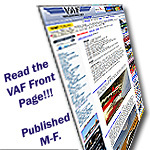 Does your POH say for flight in “VMC conditions” only, or for flight under “VFR” only. It matters because planes must be flown in accordance with their POHs as well as their operating limitations. And I’ve seen SLSA POHs that read both ways. OLs were issued in a March 2012. Current ELSA Operating Limitations do not reference the POH. Yes, I agree. I was thinking about SLSAs. I’ve seen Operating Limitations for SLSAs that permit flight in IMC if properly-equipped, but whose POHs require flights to be under “VFR.” The difference between a “VFR” limitation and a “VMC” limitation matters, because the long cross-country for an Instrument Rating has to be flown under IFR rules even if flown in VMC. So an SLSA POH that limits flights to VMC allows a properly-equipped plane to be used for Instrument training while a POH that limits flights to “VFR” prevents the SLSA from being used for the required cross-country. The RV-12 POHs that I’ve seen limit flights to “VMC” but don’t prevent flight under IFR rules (if properly equipped). Mel, wasn’t there a period when the OLs incorporated the POH? I seem to recall a thread on that subject. Not that I recall. I'll have to do some research. Not tonight!